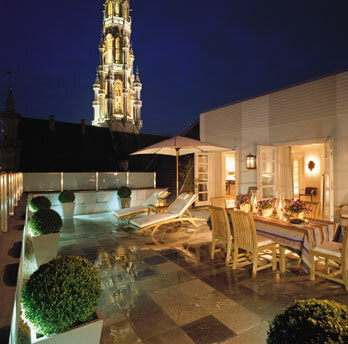 Located in the centre of Brussels next to the historic Grand Place. This contemporary 4 star hotel is close to the main commercial district and attractions of the European capital. Having undergone a complete refurbishment, the hotel provides a stylish and central base from which to explore the cobbled streets, restaurants and bars. Heavy Brussels linens are used extensively, together with red silk curtains with embroidered velvet detail, leather brass-nailed headboards, and ornate Flemish chairs and desks with clean, modern lines. 173 air-conditioned bedrooms, including 19 suites; all have marble bathrooms. Penthouse Suite with separate dining room, kitchen and roof terrace; ideal for private entertaining. All rooms are individual in style and feature surrealist prints by Marcel Broodthaers and René Magritte; some have views through to the Grand Place, whilst others overlook the churches and spires of the city. No spa / there is a fitness centre equipped with the latest cardiovascular equipment. Ballroom with natural daylight for up to 200 guests, dividable into 2 separate rooms and 5 meeting rooms for up to 40 people, theatre-style; all have natural daylight. The hotel is ideally situated in the heart of the city, adjacent to the picturesque Grand Place which acts as the focal point of the city for social events and festivals, including the renowned Flower Carpet in the summer. The numerous restaurants and bars nearby offer the chance to sample some of the 400 beers for which Brussels is famous. Other attractions can also be admired on foot, such as the many museums, antique shops, flea markets, Manneken Pis, and shops selling chocolate, tapestries and lace. The airport is just 20 minutes by car from the hotel. Transfer to and from airport / station, if required at an additional charge. The main Thalys and Eurostar terminal is just ten minutes by car from the hotel. Travel time to London is under three hours on Eurostar. Travel time to Paris is 1h 20 minutes on Thalys.